Lee Bul lives and works in Seoul. She was born in 1964 in Yongwol, South Korea, and studied at Hong-Ik University, Seoul. Lee Bul has exhibited her work internationally since 1987 and has become one of the most influential and internationally critically acclaimed artists of her generation. Her practice has mined the potential of performance and sculpture to investigate the body, particularly cultural constructions of the feminine form. Lee’s work has provoked reflections on corporeal pleasure, pain and transience, and the oscillation between reality and fantasy in contemporary science and biotechnological evolution. 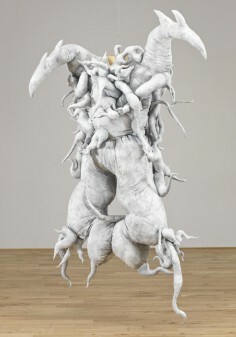 Untitled is the most complex of Lee Bul’s series of monsters. It comprises a white central body composed of multiple parts that simultaneously evoke the physical and the technological or cybernetic. Exploding outwards into space from its core are other parts of the form, including an octopus-like head, that appear frozen in space as fragments of the one entity. The physical and cultural instability of the human body is the central theme in the work of Lee Bul. Her work has consistently raised questions of gender, the prescribed role of women (particularly in a patriarchal Korean society), representations of the female body and concepts of ideal beauty. Broader issues of race and social difference, the pervasive role of popular culture in the formation of identity, and the increasing interface of science and technology with the human being and its evolution emerge in Lee’s bizarre, seductive forms. As Lee has stated, the body is ‘the most appropriate site for making statements about society, history, civilisation and culture’. While a feminist perspective infuses much of Lee’s work, it is too limiting a frame for the conceptual concerns seen in her work since 1997. This is the year in which the first of Lee’s cyborg sculptures was produced, effecting a transition from the wholly organic monster to the human; altered and functionally reordered through science, technology and mechanisation. Emerging from the realm of science fiction, Lee’s cyborgs drew on the Korean and Japanese anime (animation) and manga (complex, often violent, narrative cartoons containing moral tales and populated by characters alternately vulnerable and superhuman). Lee’s first red and blue cyborgs, seen in the National Gallery of Victoria in 1998, were partial forms cast in silicone – the contemporary material for bodily enhancement – and gave rise to a series of white polyurethane cyborgs that maintained an examination of physical ideals and beauty, and engaged with increasingly complex scientific research into the physical limitations of the human being and the extent to which the body can be penetrated by technological advances. Untitled was produced for the exhibition world rush_4 artists, the inaugural special exhibition to celebrate the reopening of the National Gallery of Victoria on St Kilda Road. This work elaborates her transition from cyborgs to works like Amaryllis and Siren, in which strangely beautiful and equally unsettling hybrid beings were the fusion of the mechanical, with organic forms inspired by insect bodies and botany. In Untitled Lee turns her attention away from the specifically feminine body to the diverse composition of the world at large, to the systems of knowledge that structure our understanding of the body and the spaces it inhabits. In doing so, Lee’s work demands a space for continued wonder in a contemporary world of overdetermination, dominated by an increasingly accelerated pace of biotechnological research, the extinction of species and political and cultural instability. L’exposition de Lee Bul (née en 1964) présente le travail prolifique et protéiforme d’une des figures les plus importantes de la scène artistique contemporaine coréenne. Lee Bul raconte depuis 30 ans une histoire dans laquelle elle établit d’étonnantes relations entre les diverses formes de la création visuelle et les différents terrains de l’imagination. Elle interroge sur la pertinence des grandes histoires mythologiques et scientifiques qui donnent l’illusion que l’humain est capable de recréer complètement la réalité biologique et, par là aussi, la réalité sociale. Elle mêle dans ses œuvres la création permanente de mythes, d’utopies et les diverses perspectives de développement d’une forme nouvelle de l’existence avec la représentation de son univers personnel, ses doutes, sa solitude mais aussi les espoirs et la joie du créateur. Elle offre une vision révisée de notre relation avec la nature et les corps humain et animal, en y introduisant des représentations scientifiques, des éléments de science-fiction et des utopies. Ses créations imaginaires, simulacres modernes, accueillent des aliens, des messagers d’un univers inconnu, étranger et angoissant et interagissent avec notre réalité post-moderne. Cet amalgame offre une poésie inattendue dans laquelle la solitude du créateur et la tristesse des pseudo-réalités se mêlent à un hédonisme et une euphorie nés de découvertes et d’imagination libre. Cet utopisme poétique met en relation design, architecture et sculpture dans une forme sensible et génère une végétation sensuelle de nouvelles figures encore jamais vues.